The Hon. 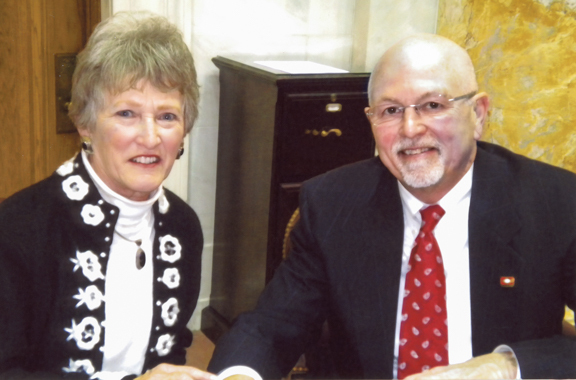 Les Carnine and his wife, Linda, have committed $250,000 to a new scholarship in the College of Education and Health Professions. FAYETTEVILLE, Ark. – University of Arkansas alumnus Les Carnine and his wife Linda, of Edmond, Oklahoma, have committed $250,000 to the College of Education and Health Professions and Campaign Arkansas. Their gift will create the Carnine Endowed Scholarship in Education Leadership. The Carnine Endowed Scholarship in Education Leadership will benefit students pursuing a Doctor of Education degree in the educational leadership program of the Department of Curriculum and Instruction in the College of Education and Health Professions. “The impact of a quality education has immeasurable benefits to not only the individual but to the community and to society in general,” Carnine said. “Quality leadership is an essential ingredient. It impacts students, families and co-workers. Linda and I want to do everything we can do to help people aspiring in the field of educational leadership. Les Carnine earned a bachelor’s degree from Buena Vista University in Storm Lake, Iowa, and a master’s degree from Central Missouri State University. In Missouri, Carnine met others who had completed doctoral degrees at the U of A, and they suggested he consider the university. Carnine and his wife moved to Fayetteville in the late 1960s. After Les Carnine earned a doctorate in educational administration, the couple moved to Independence, Missouri, where Les became a principal. They then moved to Manhattan, Kansas, where Les worked as an assistant superintendent and deputy superintendent. Over the course of his career, Carnine worked for Arkansas school districts in Harrison, Texarkana and Little Rock and the Wichita Falls school district in Texas. He also worked in banking for a short time and taught at Kansas State as an adjunct finance professor. The Carnines returned to Fayetteville in the 2000s, where Les Carnine served as an executive in residence in the College of Education and Health Professions and taught as an adjunct professor for six years. He was then elected to the Arkansas Legislature and served the state until he was term-limited. Linda Carnine spent her career as an elementary teacher – for first and second grades and gifted and talented classes – and as an educational specialist. She also taught undergraduate classes at Midwestern State University in Wichita Falls, Texas. The Carnines have 70 years of education experience between them – Linda with 27 and Les with 43. Les Carnine served on the Dean’s Advisory Council for the College of Education and Health Professions and was honored as the first recipient of the college’s alumni award for exceptional professional and personal achievement and extraordinary distinction in the education profession in 2011. The Carnines are members of the Arkansas Alumni Association and the Chancellor’s Society. About Campaign Arkansas: Campaign Arkansas is the ongoing capital campaign for the University of Arkansas to raise private gift support for the university’s academic mission and other key priorities. The campaign’s goal is to raise $1 billion to support academic and need-based scholarships, technology enhancements, new and renovated facilities, undergraduate, graduate and faculty research, study abroad opportunities and other innovative programs. The University of Arkansas provides an internationally competitive education for undergraduate and graduate students in a wide spectrum of disciplines as it works to fulfill its public land-grant mission to serve Arkansas and beyond as a partner, resource and catalyst.